“ Gender equality means that women and men enjoy the same status and conditions and have equal opportunity for realizing their potential to contribute to the political, economic, social and cultural development of your communities” NAFSO’s Women coordinator Rishmiya Bazeer explained firstly for the audience including 75 women and 10 men gathered to programme. 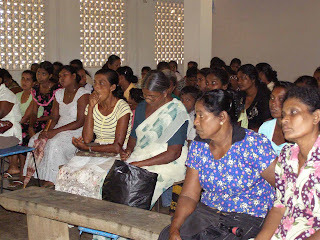 Trincomalee District “DIRIYA KANTHA “organization organized this programme for empowering their women leaders on gender equality and women empowerment. - Fishermen are allowed to fishing in the sea in the day time period. - They need to take pass from government troops for fishing in the sea. - Education of their have been collapsed because of the war. - Water problem in the district. - Trainings are needed for self employment of Women. - They have some difficulties to travel because check points are being increase day by day. - Their lives have been collapsed in the reason of high security zones. According to their analysis they are having these types of difficulties in the district. National convener of NAFSO Herman Kumara, and some other officials participated there as facilitators.